Whether for general cargo, heavy lift or bulk, the Port of Emden is a versatile seaport that offers excellent conditions and extensive transmodal services. For operators this means significant efficiency benefits in their tightly scheduled supply chain business. And Germany's most westerly port, which is also the third largest in Germany, also has some superlatives to offer here. 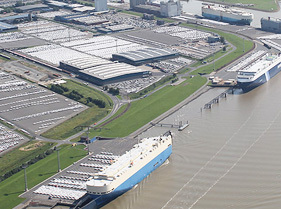 The Port of Emden offers both the largest non-tidal inland harbour and one of the largest sea locks. "Große Seeschleuse", literally the "Great Sea Lock" is manned 24x7. It is supplemented by Nesserlander Lock, which is currently being renovated and expanded. The tidal outer harbour offers operators approximately 2,200 meters of terminal facilities featuring handling options such as RoRo ramps and rail links. In the wind energy sector, the Port of Emden has established itself as the home port for onshore and offshore business. Emder Hafenförderungsgesellschaft e. V. promotes and supports the Port of Emden. Our association offers a competent point of contact for operators and prospective customers of the Port of Emden, and is committed to its interests and its success. We are partners of Seaports of Niedersachsen GmbH, the organisation that represents the nine seaports in Lower Saxony with their numerous stevedoring operations, trans-regional logistics networks and specialists for port services of all kinds. As a port marketing company, Seaports globally communicates the location benefits, and wide range of services offered by the Lower Saxon seaports to potential customers, thus contributing towards generating and maintaining added value and securing jobs in the region. Here you see the current ship movements in our port.